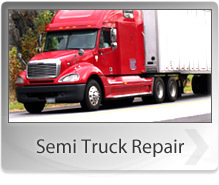 For all of your Trailer Work, Midwest Auto & Diesel Repair, LLC in Cameron, MO 64429 knows how to fix the problem. Our knowledgeable experts will have you back on the road in no time. Leave the dirty work to us! Faulty brakes put you and other road users at a great risk. Faulty brakes increase the chances of collisions. If your truck has braking issues, visit or call Midwest Auto & Diesel Repair, LLC today. At Midwest Auto & Diesel Repair, LLC, we have brake experts who will diagnose and work on your truck braking system. With a faulty suspension system, the truck's performance and handling will be greatly affected. Also, driving on rough roads will not be an easy task. If roads were perfectly flat, suspensions would not be necessary. To have your truck's suspension system checked, repaired or replaced by suspension experts, contact or visit Midwest Auto & Diesel Repair, LLC in Cameron, MO 64429 today.